Gaylussacia frondosa.Martin Schoofs.Greenbelt Native Plant Center.S. I. N.Y. C.US Botanic Gardens and Botanic Gardens Conservation International .Conservation and Land Management Program.clminternship.org (Accessed 7/2014). Gaylussacia frondosa is a shrub to 2 m tall, roots associated with highly specialized ascomycota ericoid mycorrhizae, (Allen1991) that increase nutrient uptake, colonial from underground stems. Leaves alternate, to 7 cm long, pale blue-green, finely hairy whitish below, resin dots below. Flowers white, urn-shaped 0.3-0.45 cm long, on elongate slender stalks; in open, pendant, unbranched clusters accompanied by small, green bracts, May-June, flowers pollinated by bumble bees & smaller bees (Rathcke 1988). 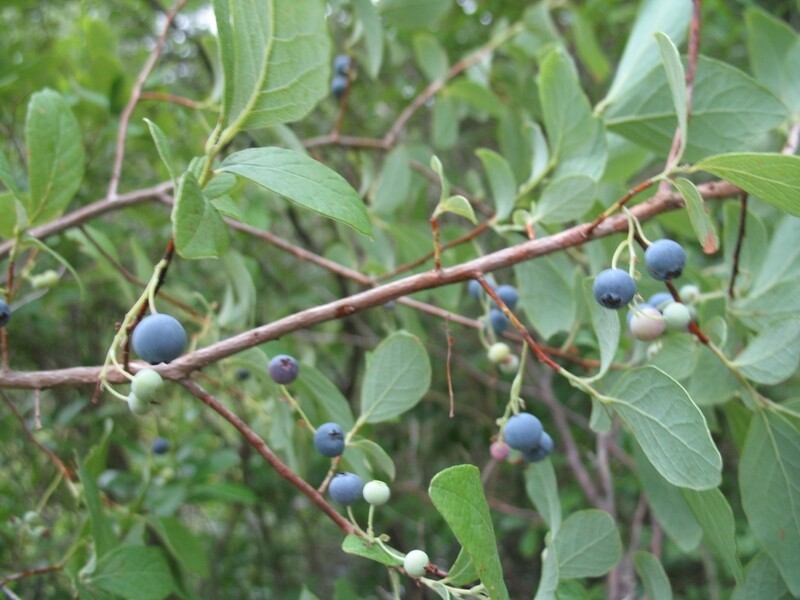 Fruit fleshy, blue with white bloom, ca 0.7 cm, on long, pendant stalk; Aug.-Sept. Seeds ca 10. Seed load 6%. pulp nutrients: water 83%, lipid 1%, protein 2%, CHO 33% (White 1989). Fruits edible, sweet, but seedy, eaten by many birds and mammals, including raccoons (Martin et al 1951; Wilson 1993). Habitat: Understory of moist, undisturbed oak woods typically on acidic, nutrient-poor soil.